A few days ago, I picked MiniMac up from school with a soundtrack of a thunderstorm in the background. He told me it had rained on them on the playground earlier and he could now hear the noise outside. As we were making our way out of the school, I asked, "You know what that is, right?" He answered, "Its not God watering His flower garden, Mom. Rain is actually caused by cloud formation and moisture in those clouds." For the record, I have NEVER told him rain is God watering His flower garden. Thunder is God playing drums, yes, but never a mention of rain and a correlation to a flower garden. When we got outside and heard the thunder, he informed me the thunder and lightening no longer bother him. "I am very brave, Mom." I concurrred. Later that night, as electricity flickered in our house, a thunderstorm blew in. From his room, MiniMac called up to us. "I don't really care for the thunder!" he said earnestly. "I think it will pass, baby." I replied. "Really, Mom, it is VERY loud and bright down here!" "If you close your eyes, you won't see it," John tells him. "I can STILL HEAR IT Daddy!" Good retort my little man. "Mom, I am getting scared down here! Can one of you please come down!" A statement, not a question. I respond, "One of us will certainly come down but you told me you were very brave today." As our tiny son's voice starts quivering, he replies, "I was only brave then because I was wearing my Superman shirt." John went down and laid in bed with MiniMac until he fell asleep, but it made me think about his statement. Imagine if bravery were as simple as merely putting on a Superman shirt. I don't know if it would work at our age, but not only is it worth an effort, it is representative of the sheer power of belief. Welcome to the weekend. Its currently 80 degrees in Atlanta and sultry. We like it hot. I have just returned from a four day work trip and need a dip in the pool, alone time with my husband and quite possibly, a cocktail. I am whipping up some delicious vittles today with some poolside time in mind. Today is the double yum presentation of Goat Cheese and Poblano Chile Guacamole and a little something to wet that whistle. 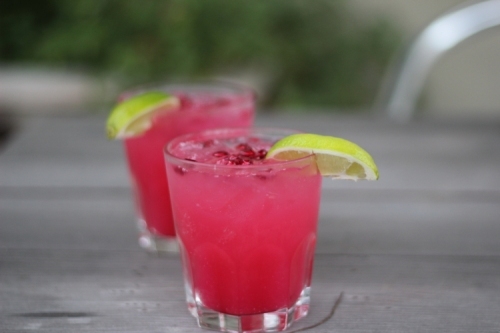 How about a Pomegranate Margarita with a little Habanero infused Tequila? Yes please! From my kitchen to yours, let's get the party started. Have a gorgeous weekend. Roast 1 poblano chili on a baking sheet on 450 for about 15 mins until skin starts to blacken and char. Remove, let cool fully and then peel off skin. Seed, de-stem, and dice finely. 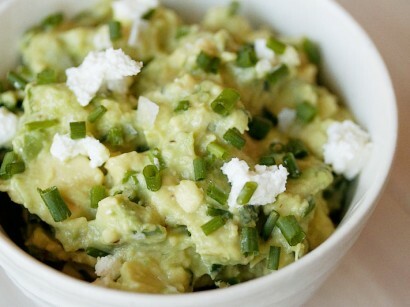 Mash avocados and fold in other ingredients. Pour some delicious chips into a bowl ( I love Baked Tostito scoops and Xochitl. Dig in. Say yum. Place ingredients in mason jar or glass bottle. Cover tightly and shake. Store in cool, dark place and shake daily. Taste each daily until flavor you desire is achieved (2-4 days is the rec for tequila.) Strain through a fine mesh strainer (or coffee filter) into another clean, airtight container. Store in fridge. Place ice in large pitcher. Add all ingredients except garnish. Stir. Strain into ice-filled glasses. Garnish with seeds and lime wedges. Enjoy several.